There are 4 key stages of plan preparation. This initial stage includes the development of a comprehensive evidence base, publishing of the Timetable, and Statement of Community Involvement (SCI) and the publication of the Preferred Options Paper (POP). The revised Timetable, published in June 2017, sets out the programme for the delivery of the LDP including key milestones and indicative timelines for plan production through to final adoption. We will post any future updates or revisions to these Papers on this page. The Preferred Options Paper (POP) is the first public consultation document to be issued in the emerging LDP. It includes a Plan Vision, Objectives and Overarching Principles, as well as identifying a range of strategic planning issues that had been identified in our Borough. The purpose of the POP was to stimulate debate on these issues to help inform the next stage of the LDP. Publication of the POP Public Consultation Report in December 2017 marks the completion of Stage 1 of the Plan process. This stage of the LDP process consists of the preparation and publication of the draft Plan Strategy which will be strategic in nature and based on all relevant information, including responses to the POP. This will be subject to public consultation and Independent Examination (IE) prior to adoption. The Department for Infrastructure (DfI) will appoint the Planning Appeals Commission (PAC) or other independent examiner to hold the IE. The IE will subject the draft Plan Strategy to soundness tests which will determine if correct procedure has been followed, how it has taken account of central government plans, policy and guidance, and whether it is generally satisfactory in regard to considerations of coherence, consistency and effectiveness. Following the IE, the examiner will issue a report of its findings to the Department for consideration before it issues a binding report to the Council. The Council must then incorporate any changes outlined in the binding report and subsequently adopt the Plan Strategy. 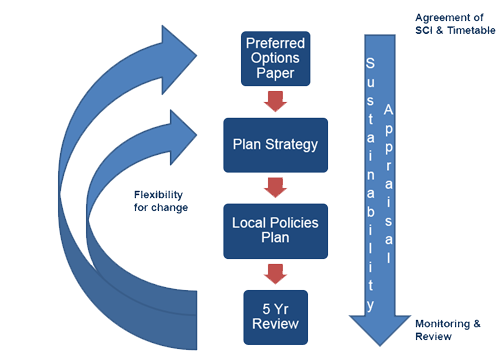 The Local Policies Plan is the second Plan document and must be consistent with the adopted Plan Strategy. Its purpose is to provide detailed site specific proposals (for example, housing zonings) relating to the future development of the Plan area. The draft Local Policies Plan will also be subject public consultation and Independent Examination. Once the Local Policies Plan is adopted, the whole LDP is placed on a statutory footing. The final stage in the LDP preparation process is Monitoring and Review which is essential in establishing how the LDP objectives are being achieved and whether any changes are required. This will include the preparation of an Annual Monitoring Report. We will undertake regular reviews of its LDP at least every 5 years from the date of adoption of the Local Policies Plan. Both the Plan Strategy and Local Policies Plan together with any supporting documents and various Plan related assessments will be placed on online.